Receptive aphasia, also known as Wernicke’s aphasia, fluent aphasia, or sensory aphasia, is a type of aphasia traditionally associated with neurological damage to Wernicke’s area in the brain, (Brodmann area 22, in the posterior part of the superior temporal gyrus of the dominant hemisphere). However, the key deficits of receptive aphasia do not come from damage to Wernicke's area; instead, most of the core difficulties are proposed to come from damage to the medial temporal lobe and underlying white matter. Damage in this area not only destroys local language regions but also cuts off most of the occipital, temporal, and parietal regions from the core language region. People with receptive aphasia are unable to understand language in its written or spoken form, and even though they can speak with normal grammar, syntax, rate, and intonation, they cannot express themselves meaningfully using language. Receptive aphasia is not to be confused with Wernicke-Korsakoff syndrome. When we want to speak, we formulate what we are going to say in Wernicke’s area, which then transmits our plan of speech to Broca’s area, where the plan of speech is carried out. Wernicke’s Area is located posterior to the lateral sulcus, typically in the left hemisphere, between the visual, auditory, and somesthetic areas of the cerebral cortex. A person with this aphasia speaks normally but uses random or invented words; leaves out key words; substitutes words or verb tenses, pronouns, or prepositions; and utters sentences that do not make sense. They have normal sentence length and intonation but without true meaning. They can also have a tendency to talk excessively. A person with this aphasia cannot understand the spoken words of others or read written words. Speech is preserved, but language content is incorrect. Substitutions of one word for another (paraphasias, e.g. “telephone” for “television”) are common. Comprehension and repetition are poor. Patients who recover from Wernicke’s aphasia report that, while aphasic, they found the speech of others to be unintelligible. And, despite being cognizant of the fact that they were speaking, they could neither stop themselves nor understand their own words. The ability to understand and repeat songs is usually unaffected, as these are processed by the opposite hemisphere. 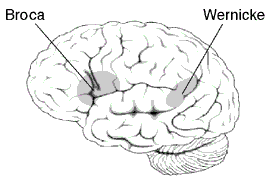 Damage to the posterior portion of the left hemisphere’s superior and middle temporal lobe or gyrus and the temporoparietal cortex can produce a lesion to Wernicke’s area and may cause fluent aphasia, or Wernicke’s aphasia. If Wernicke’s area is damaged in the non-dominant hemisphere, the syndrome resulting will be sensory dysprosody — the inability to perceive the pitch, rhythm, and emotional tone of speech. Patients who communicated using sign language before the onset of the aphasia experience analogous symptoms. 2) A defect in speech. A patient with Wernicke's aphasia can and may speak a great deal, but he or she confuses sound characteristics, producing “word salad” in extreme cases: intelligible words that appear to be strung together randomly.